Terahertz (THz) waveguides are the subject of an intensive research aimed at transferring THz radiation over long distances while preserving the pulse amplitude and phase. Standard approaches are not suitable since most of the THz generation techniques deliver extremely large bandwidth pulses, corresponding to single-cycle electric wave packets, which will strongly disperse in dielectric waveguides. This issue is even more important considering that one of the main applications of THz radiation is time-domain spectroscopy, where the temporal coherence of the probing pulse is a must. On the other hand, dispersion-less waveguides have been known at longer wavelengths, e.g. microwave and radio-signals, for several years . As previously proposed by Mbonye and coworkers for gigahertz signals , we have investigated a two-wire configuration properly scaled for the transmission of THz signals. We found that low dispersion could be achieved for a broad THz bandwidth over 20 cm of propagation by employing two Copper wires (250 μm in diameter) separated by a 300 μm gap in air. Figure 1 shows the measured THz signal (normalized) for both (a) the signal injected into the waveguide and (b) the signal transmitted by the two-wire waveguide and measured via electro-optical sampling. In Figure 1 (c) the normalized amplitude spectra are shown for both the input and the transmitted pulse. The recorded data clearly demonstrate that the single-cycle character of the input pulse is preserved even after 20 cm of propagation, with negligible modulations in the power spectral density, on a bandwidth larger than 2 THz. Fig. 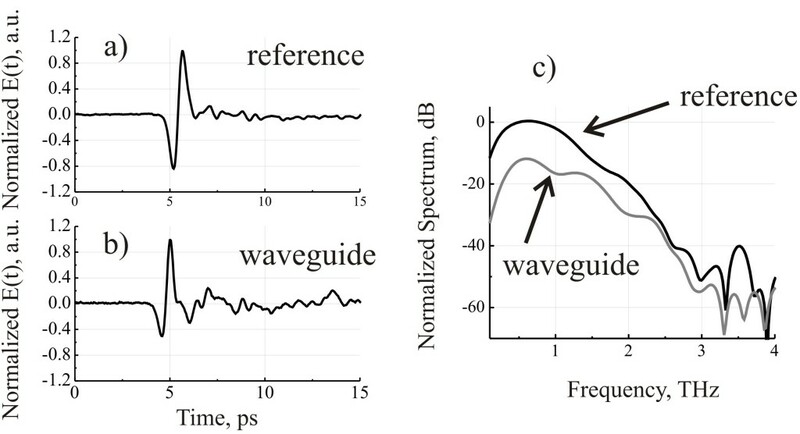 1: Measured normalized terahertz pulse for both (a) the reference signal and (b) the transmitted signalover the 20 cm waveguide; (c) normalized amplitude spectra of the reference and the waveguide signal. Remarkably, the two-wire waveguide supports a quasi-TEM mode confined on a very small area in between the wires. Figure 2, taken from reference , shows the Quasi-TEM mode in the transverse plane of the two-wire waveguide with a sub wavelength distance between the wires. This mode pattern was numerically calculated for wires of radius 150 µm placed 200 µm apart in free space. As can be seen in the inset, the mode is confined in a very small region and is polarized perpendicular to the wire and along the transverse plane carrying the two wires as indicated by the arrows. The interesting properties of this waveguide opens up new intriguing perspectives e.g. for high-spatial resolution imaging. Fig. 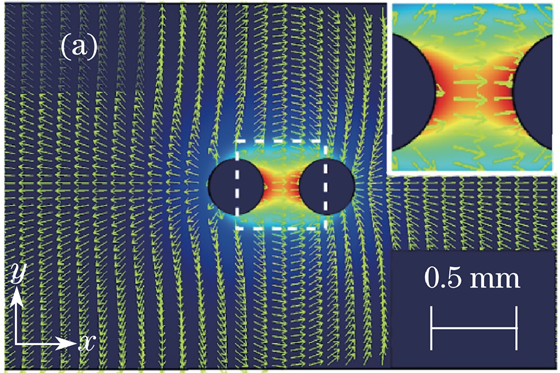 2: Mode field distribution in the transverse plane between two copper wires of radius 150 µm placed 200 µm apart; the arrows indicating the local field polarization direction. R.E. Collin, Foundations for Microwave Engineering, JohnWiley & Sons, Inc., NJ, US (2001). M. Mbonye et al., Applied Physics Letters, 95, 233506 (2009). P. Tannouri et al., Chinese Optics Letters9, 110013 (2011).